Here's another couple of geomorphs from the upcoming geomorph book. I've tried to include a variety of spacecraft in the geomorphs, so I added a new 50 ton launch. 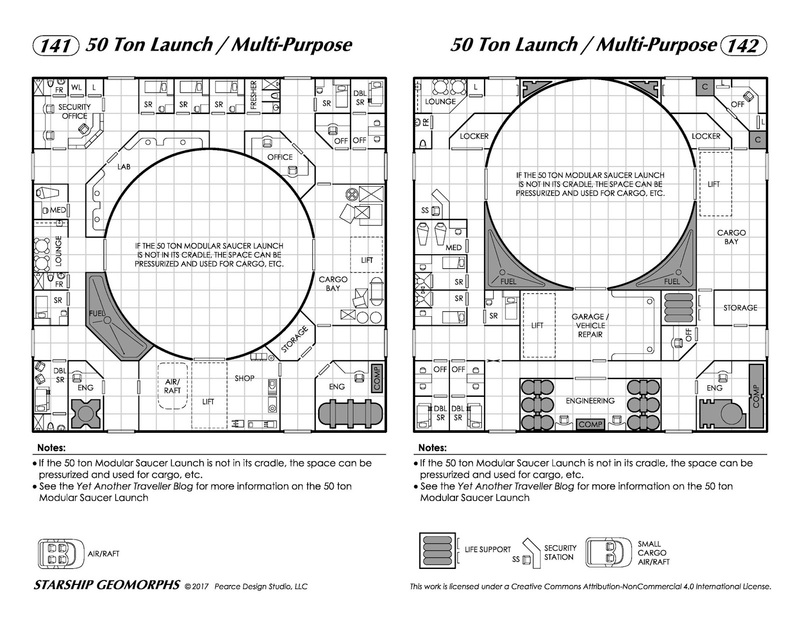 The deck plans and modules for the launch don't really fit in the book, so I've decided to add them here. I'm kind of a sucker for ships with modular components, so this isn't too different from the Nirvana Class Dropship that I've posted earlier. 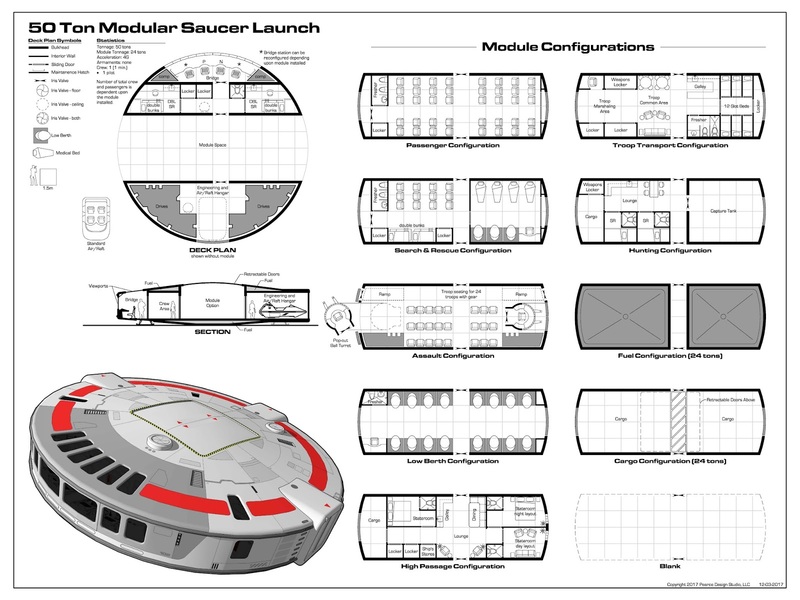 For a higher resolution PDF, click this link: (Traveller Starship Deckplan 50 ton Modular Saucer Launch). The deckplan was created to be printed out on 18"x24". Scale is 1" = 10'-0" so it can be used with 15mm miniatures. Enjoy! I didn't know what geomorphs were. Had to Google it. Interesting stuff. Excellent post. I absolutely love disc-shaped vessels, and your 50 ton launch does not disappoint. Thanks so much for resuming your posts; your work has added a great deal to my current campaign. I am looking forward to the completed geomorphs book as well. Thanks, Mactavish - glad you like it. I have a couple interior illustrations for the saucer launch in the works: the bridge and the double bunk stateroom. If they're not included in the geomorph book, I'll post them to the blog. 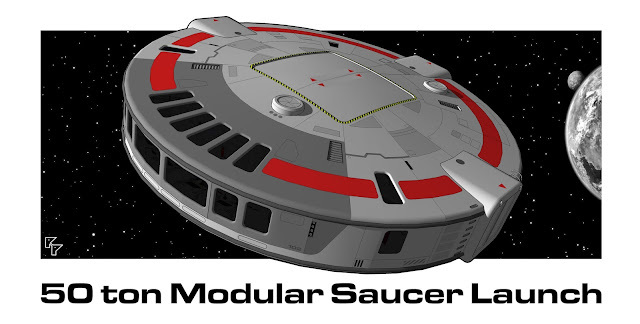 Is it possible to create Ortho views of the new 50 ton Modular Saucer Launch.